The International Year of Chemistry, IYC2011, is well under way across the globe. The celebration began in France and then moved to the United States and many other countries around the world. During the last week of January, academics, industry leaders, Nobel laureates, and officials of many governments gathered at UNESCO headquarters in Paris to celebrate IYC with speeches, concerts, and social events. After the UNESCO event on 27 and 28 January, a different group gathered at the Sorbonne on 29 January to honor Marie Curie. The year 2011 is the centennial of Curie’s Nobel Prize in Chemistry. Curie also won a Nobel Prize in Physics in 1903. Speakers throughout the day talked about Curie’s life, the difficulties she faced and overcame, and the many sacrifices she made on her path to immortality. 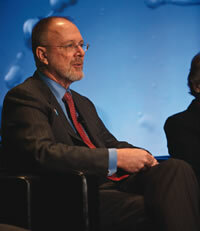 Joshua S. Boger, former chair and CEO, current board member, Vertex Pharmaceuticals. In the United States, the celebration began just two days after the festivities in Paris ended. On 31 January, the evening before the official launch of IYC in the United States, The Dow Chemical Company—one of the IYC2011 Global Partners—and the Chemical Heritage Foundation (CHF) hosted a dinner for 180 leaders in the chemical enterprise in the United States at the CHF Conference Center in Philadelphia. The two-hour event began with each panelist giving his or her perspective on how chemistry could help to solve the huge challenges that face the world today and in the future. Following the opening talks, the six panelists had a lively discussion. For the final 30 minutes, the panelists took questions from the 200+ audience at CHF as well as from those watching live on the web. The entire two-hour presentation is available online. Just click on the IYC2011 logo at www.chemheritage.org. The next evening, 2 February, in collaboration with Headhouse Books, CHF hosted a book discussion of The Emperor of Scent by Chandler Burr. Chemist Joseph Rucker, project leader, Biosensors-Integral Molecular, Inc., Philadelphia, led the discussion of the sense and sensibility of smell. On Thursday, 3 February, Professor James Armstead, a historical recreator, came to Philadelphia in the character of Percy Julian, the great 20th-century chemist who was the subject of a two-hour documentary titled Forgotten Genius. Released in 2005, this award-winning feature-length film tells the story of Julian’s long and improbable life. Armstead is an actor of considerable range. He has recreated many characters and spends the day “in the role” of the men he portrays. Armstead spoke to student groups at the African-American Museum in Philadelphia and at The College of Physicians. 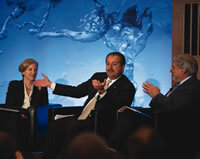 Ellen J. Kullman (left), chair and CEO, DuPont; Andrew N. Liveris (middle), chair and CEO, The Dow Chemical Company; and Dan Nocera, Henry Dreyfus Professor of Energy and professor of chemistry, Massachusetts Institute of Technology. On Friday, 4 February, Elemental Matters, a new exhibit of seven contemporary artists responding to the periodic table of elements, opened to the public for the first time. All of the artists, even from as far away as Germany, traveled to CHF for the opening. Nearly 250 visitors came to CHF to meet the artists and participate in the opening. Their work will be on display in CHF’s Hach Gallery through December of this year (see feature here). Separate from these activities, CHF made chemistry part of celebrating Valentine’s Day by hosting “Science on Tap” at Philadelphia’s National Mechanics bar and restaurant on 14 February, featuring Sam Kean, author of The Disappearing Spoon and Other True Tales of Madness, Love, and the History of the World from the Periodic Table of Elements. CHF has also launched “It’s Elemental,” a national high-school video competition that invites students to submit videos inspired by a single element for an interactive periodic table. Nearly 700 student teams submitted videos. To watch, go to www.chemheritage.org/elementalvideos. And this report just covers the opening weeks of IYC. For events throughout this important year, go to the website below. Page last modified 17 May 2011.